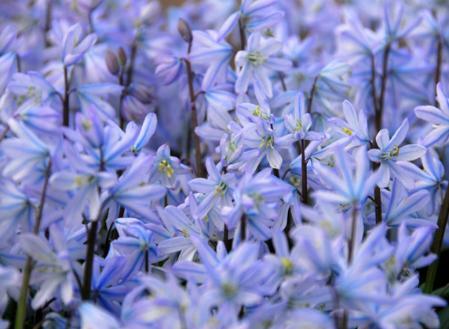 Scilla is a large genus with more than 100 species. 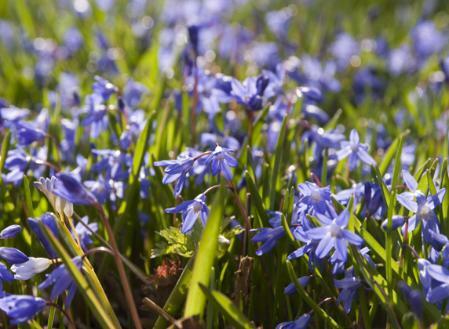 These days, certain of these species are now classified under the genus, Hyacinthoides. The name Endymion is also still used to refer to certain species. This scilla is the earliest to flower and was introduced to the Netherlands from Iran in 1931 by the Dutch firm, Tubergen. It tolerates a lot of shade and is beautiful when planted together with Winter aconite and snowdrops. 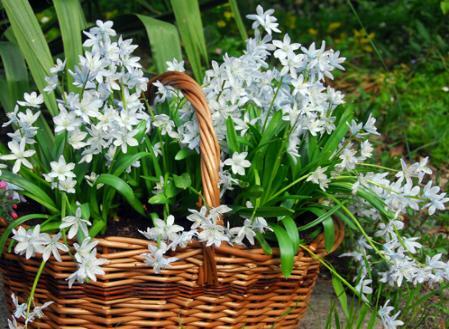 As evidence to the fact that it is one of the most winter hardy of the little bulbous plants, Scilla siberica can be found growing in Central Russia. It combines nicely with Glory-of-the-snow which flowers a bit earlier. This is one of the best bulb plants for naturalising. The little round bulbs are covered in a loose dark tunic and are commonly available. Three to five of the star- to bell-shaped nodding flowers can be found on each stem, each bulb producing 3 to 4 flower stems - certainly enough to call it a profusely flowering bulbous plant. 'Spring Beauty', a selection that can be vegetatively propagated, has somewhat larger flowers and sturdier stems. 'Alba' is a rare, white form.